One of my favorite things (this month) is the honey badger. Have y’all seen the you-tube videos about the honey badger? I pinned the re-make, and posted it to Facebook last night. I can’t help it…the video just tickles me, and when I was in my first week of not smoking, there were several references to the likeness between myself (and all my other newly quit friends) and the honey badger. For those of you that haven’t seen this video, it’s here, but if you’re at work or have little kids around? Volume check, please. You have been warned. That said, it’s even FUNNIER if you see this video first. The latter has a very proper British sounding gentleman narrating, and is office/child friendly, unless headless snakes and dead things bother you. 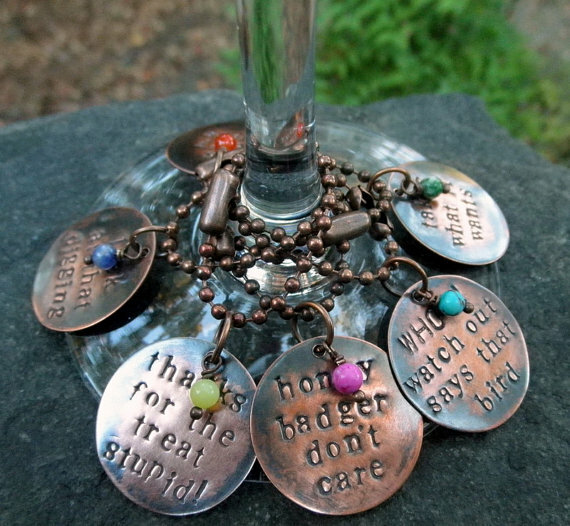 The link to purchase these (for me or any other honey badger loving wine drinker on your list) are HERE. Thanks for the treat, Stupid! *snicker* Seriously, if you get me these for Christmas, I promise you that I will try not to say that in my thank you card. For my next trick, I will be heading to the mall in the morning to shoot Santa with a Canon. It’s always fun to say that. Had I been a Nikon user, it wouldn’t have been quite as effective, I don’t think. At any rate, I really enjoy working as the mall photographer. I get to do some neat things, like get on the roof to shoot fireworks, or collapsed roof/ceilings/crowds (those are adventures I’ll share with you some time), special events, and the like. I do love this time of year, though, as the children are all rosy-cheeked and excited about the arrival of everyone’s favorite jolly old elf. It’s always so much fun to capture the kids’ expressions (especially the little ones) when they see Santa for the first time that season. It’s even better when they are not screaming in terror. Random Acts of Hygiene: I hate dental floss. I really do. So much so that I will use whatever I can find to get that “thing” out of my teeth. Toothpicks are too big, but I find those little subscription cards in magazines do really well. I did not have one available last night, and up until then I had a perfect nine manicure. (Broke one on Sunday…Henna bag accident.) I thought it would be quick and painless to get that piece of pork chop out of my teeth with the nail on my left pinkie finger. Not so much. Stupid thing broke off. Between my teeth. Had to use dental floss to get the piece of nail out I couldn’t extract by hand. Hygiene FAIL! P.S. I really want to figure out how this blogroll rolls, so that my favorite blogs will show up instead of that stuff that is there now. This entry was posted in Uncategorized and tagged Dental Floss, Honey badger, Santa, Stop Lights. Bookmark the permalink. I love honey badger. He don’t give a Sh*t! “Whoa! Watch out,” said that bird! 🙂 Honey badger don’t care!